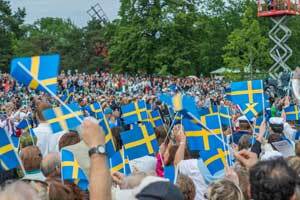 National Day in Sweden falls on June 6th each year and celebrates Sweden as a nation encouraging national pride. People can attend national pride parades in Stockholm and other cities as well as attend gatherings that support Sweden's as a modern nation. This day is a national holiday with government offices and most businesses closed. This day has its roots going all the way back to 1916 during the Stockholm Olympic Stadium honoring the election of King Gustav Vasa in 1523 and the founding of modern day Sweden. The holiday became official in 2005 as a national holiday replacing Whit Monday.